When Peter the Venerable (1092–1156) became abbot of Cluny in 1122, that grand experiment in monasticism was already over 200 years old. 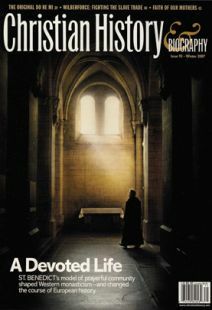 Many felt that powerful Cluny—with its massive Abbey Church, its extensive library, and its numerous priories—had become too worldly and was itself in need of reform. After all, no real monk needed the indoor plumbing that Cluny had! Enter Peter, the son of a nobleman of Montboissier, who had taken monastic vows in his teens and quickly moved up the monastic hierarchy. After his election as abbot of Cluny, Peter instituted a series of reforms intended to restore discipline to the priories, assure the financial health of the monastery, and boost the educational level of the monks. This reform itself was controversial; Peter frequently sparred with his friend Bernard of the rival monastery at Clairvaux, who believed that the central concerns of the monk should not be property and education, but prayer and work. Peter died at Cluny on Christmas Day in 1156. The influence of the monastery he loved was quickly fading, and the abbot who had been labeled the Venerable because of his godliness and his passion for reform became its evening star. Count Gerald of Aurillac took the values of the monastery into the realm of everyday life—and the battlefield.